Prepare to be wowed! Don this U.S. Divers' mask and snorkel combo and enjoy clear, panoramic vision and easy purging with the Admiral 2 LX mask and breathe easy through the Island Dry snorkel. Enjoy the underwater world! Prepare to be wowed! Don this U.S. 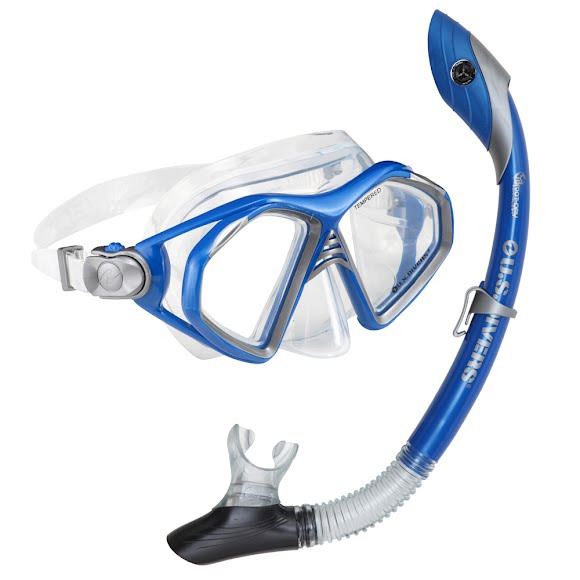 Divers &apos; mask and snorkel combo and enjoy clear, panoramic vision and easy purging with the Admiral 2 LX mask and breathe easy through the Island Dry snorkel. Enjoy the underwater world! Pivot-Dry Technology is the result of many years of snorkeling and diving experience. The Pivot-Dry snorkel design provides the ultimate in function and comfort to ensure that your snorkeling adventures are as fun and comfortable as possible. The patented design of U.S. Divers Pivot Dry snorkels feature a pivoting top that not only provides an excellent splash guard while on the surface, but it will also close and seal out water when you go under. Whether on the surface or under the water no water enters the snorkel, maintaining a dry and open breathing passage. Unlike most dry snorkels the unique design of the Pivot-Dry top also provides a large open tube for easy breathing while on the surface, yet it keeps all water out! While snorkeling on the surface of the water just breath normally. When you want to dive under the water take a deep breath and then submerge. The snorkel will automatically close and seal out the water from the tube. When you resurface just exhale normally and begin breathing again. It&apos;s so easy it&apos;s almost like magic!